The U.S. Office of Personnel Management (OPM) recently re-categorized the disability codes for specific disabilities and conditions. New codes have been created to more accurately reflect what is reported. Therefore, even if you have previously identified your disability status, the information may no longer be accurate. All employees are strongly encouraged to visit Employee Express to review and update their information. Why is this important? This information helps NASA to provide accurate demographic data as required by OPM and the Equal Employment Opportunity Commission (EEOC). Further, it allows NASA to measure progress towards reaching Federal workforce representation goals for individuals with disabilities and supporting Presidential Executive Orders related to diversity and inclusion in the workforce. Understandably, some of you may be hesitant to identify your disability status. However, you can be assured that all personally identifiable information, including disability status, is protected by the Privacy Act of 1974, and identification is strictly voluntary. Also, your information can only be accessed by NASA officials with a “need to know,” such as the staff in the NASA Office of Diversity and Equal Opportunity (ODEO) and the NASA Office of Human Capital Management. You may also review your race, ethnicity, as well as your disability data in Employee Express and make any necessary changes — it only takes a few minutes. Log into Employee Express (https://www.employeeexpress.gov) and click on “Disability Update” to verify or update your status. You can also update other information, such as level of education, race, and ethnicity. Once you make and save your selections, you will see the updates when you login to Employee Express in the future. 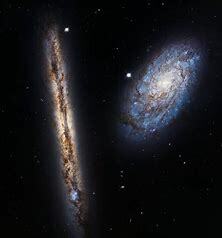 Questions regarding NASA’s Disability Program or the disability codes can be directed to Rebecca Doroshenk, Office of Diversity and Equal Opportunity, at (202)358-0038 or rebecca.d.doroshenk@nasa.gov. 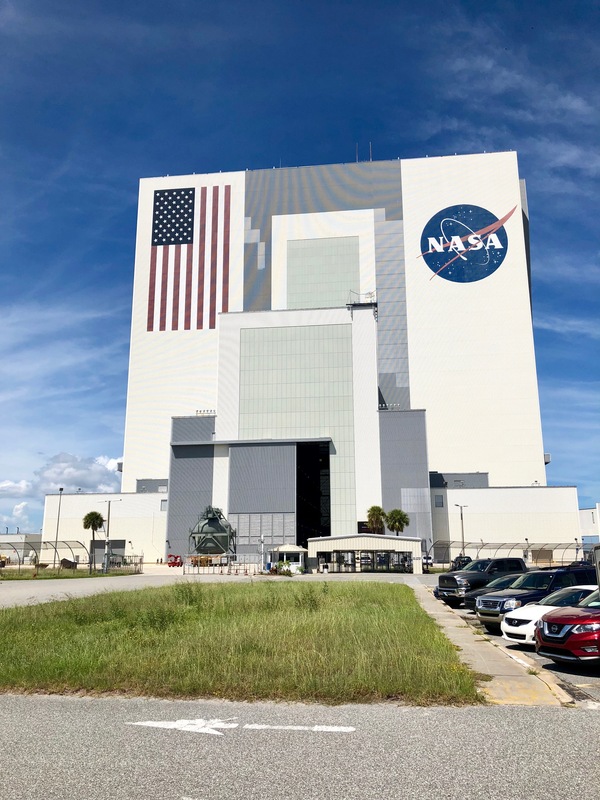 Steve Shih, NASA’s Associate Administrator for the Office of Diversity and Equal Opportunity, traveled this month to NASA’s Kennedy Space Center (KSC) to participate in a number of events in support of the KSC workforce. Steve served as the moderator of a Diversity and Inclusion (D&I) program at the KSC Supervisor All-Hands Meeting held by KSC Director, Bob Cabana, to emphasize the importance of D&I. Subsequently, Steve taught two classes on anti-harassment to KSC leaders. Steve also visited a number of KSC organizations to interact with KSC personnel and to learn more about KSC’s missions. Finally, Steve visited the KSC Visitor’s Center, where he observed the new Astronaut Training Experience for the public and also visited the Astronaut Hall of Fame, in which KSC Director Cabana is inducted. Each year, Americans observe National Hispanic Heritage month from September 15 – October 15, by celebrating the histories, cultures and contributions of American citizens whose ancestors came from Spain, Mexico, the Caribbean and Central and South America. The observation started in 1968 as Hispanic Heritage Week under President Lyndon Johnson and was expanded by President Ronald Reagan in 1988 to cover a 30-day period starting on September 15 and ending on October 15. It was enacted into law on August 17, 1988, on the approval of Public Law 100-402. The 2018 Hispanic Heritage Month theme: “Hispanics: One Endless Voice to Enhance our Traditions” invites us to reflect on Hispanic American’s tradition, history and culture that continue to help enrich the fabric of America. The contributions of Hispanics expands across all areas of STEM, military service, politics, healthcare, art, entertainment, entrepreneurship and beyond. As we recognize Hispanic Heritage Month, I want to take this opportunity to reinforce our commitment to equal opportunity, diversity and inclusion and thank all of NASA’s Hispanic Special Emphasis Program Managers that are passionately working to promote equal opportunity for Hispanics in all aspects of employment and that actions are taken to address barriers to full participation and inclusion. Additionally, I want to recognize all of NASA’s Hispanic Employee Resource Groups for serving as strategic partners to promote a culture of equal opportunity, diversity and inclusion. In commemoration of National Hispanic Heritage Month, I invite all employees to frequent the ODEO blog to get information on various activities across NASA and to participate in events in your communities. On September 26, 10:30 – 11:30 a.m. in the Pearl Young Theater, Langley Research Center is presenting “Hispanic American Tradition, History and Culture” with international keynote speaker and author, J.A. Rodriguez, Jr.
Join Langley for this entertaining and engaging take on the Hispanic American tradition, history and culture. This celebration of Hispanic Heritage Month is brought to you by the Hispanic Employee Advisory Committee (HEAC) and the Office of Equal Opportunity Programs (OEOP). 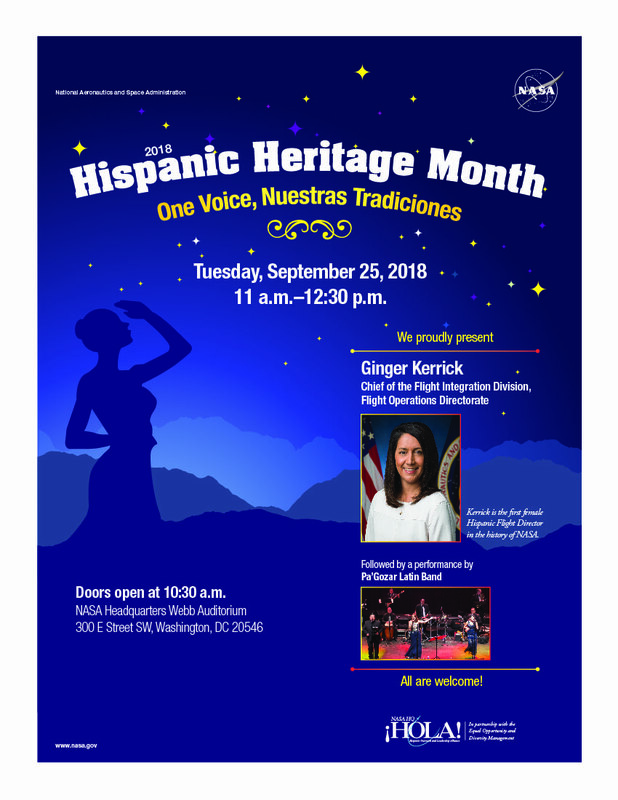 We are proud to present this year’s keynote speaker for NASA Headquarters’ Hispanic Heritage Month event… Ginger Kerrick. She is the first Hispanic female flight director in the history of NASA. 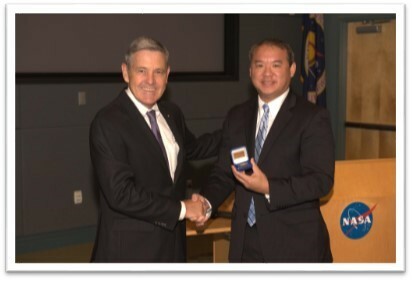 Flight directors play a critical role in the success of our Nation’s human spaceflight missions. They sit at the helm during a human spaceflight, responsible for the success of missions and the highly trained teams of engineers and scientists that make them possible. Hosted by the Hispanic Outreach and Leadership Alliance (HOLA) in Partnership with the Equal Opportunity and Diversity Management Division (EODM), “One Voice, Nuestras Tradiciones” will take place on Tuesday, September 25th at 11 a.m. in the James Webb Auditorium, 300 E Street, SW D.C. Come join us as we highlight and celebrate Hispanic heritage and culture. The event will conclude with a live performance by Pa’Gozar Latin Band and is open to the public. NASA is committed to providing reasonable accommodations for employees as part of our dedication to individuals with disabilities—so that you can enjoy full access to equal employment opportunities. 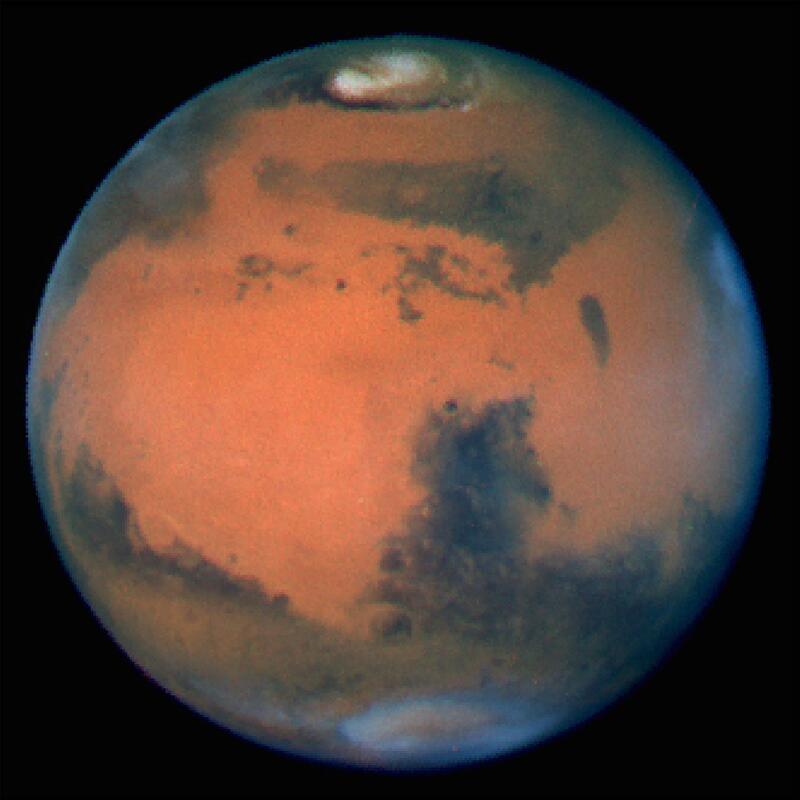 For more information, see: https://odeo.hq.nasa.gov/policy. 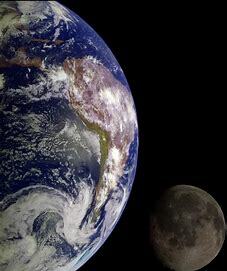 Or contact Disability Program Manager Rebecca Doroshenk, (202) 358-0038, rebecca.d.doroshenk@nasa.gov. The Office of Diversity and Equal Opportunity knows: When you work better, NASA works better! Rick Reback serves as the Office of Diversity and Equal Opportunity’s Director of the Complaints and Programs Division. 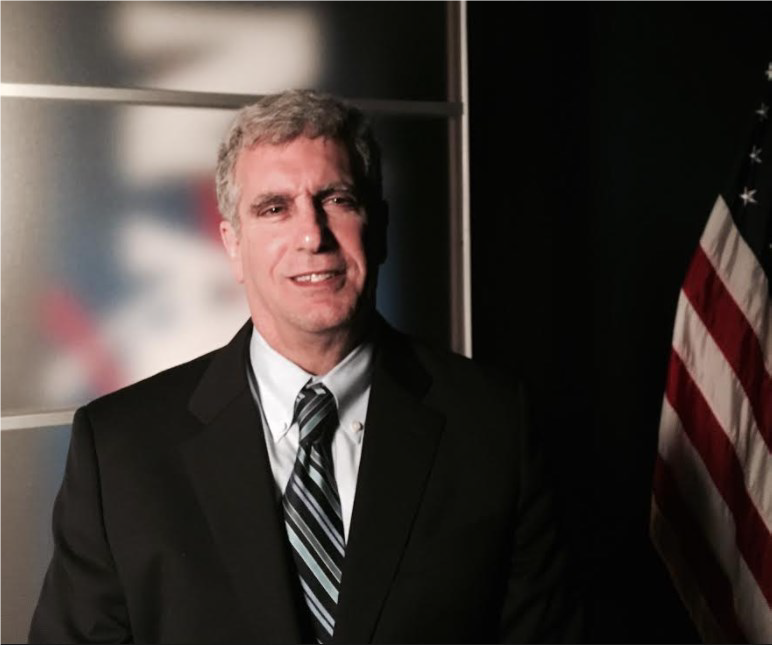 Rick brings many years of service and a strong commitment to fairness and transparency in Government operations. Rick is a graduate of Duke University and the University of Texas School Law. He clerked for the Honorable Thomas M. Reavley, U.S. Court of Appeals for the Fifth Circuit and served at the Department of Homeland Security (DHS) as Counsel to the Inspector General, joining DHS at its creation. Well-versed in employment law, he also served as an Assistant U.S. Attorney in Washington, D.C. Immediately prior to NASA, Rick was Acting General Counsel and Deputy General Counsel at the Defense Nuclear Facilities Safety Board, an independent commission with oversight of the safety and security of the country’s nuclear arsenal. Rick brings creative and innovative ideas to his work. ODEO is very excited to have him as a team member! 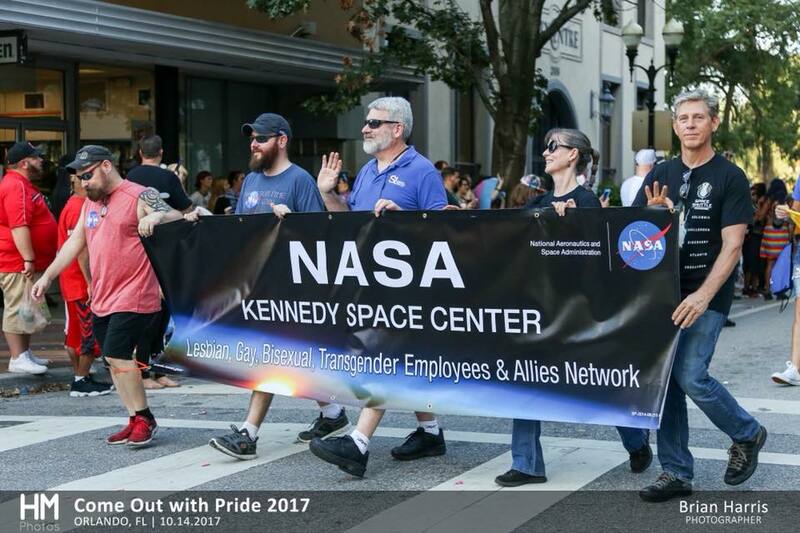 Kennedy Space Center has had some great Diversity and Inclusion events this year, with more still to come! 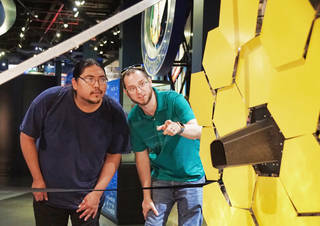 A group of college students and their faculty advisors from Northwest Indian College and Chief Dull Knife College recently toured NASA’s Kennedy Space Center with an opportunity for an up-close look at career opportunities. All were members of winning teams that successfully flew high-powered rockets in the First Nations Launch competition. APAC hosted an event, “United Our Vision By Working Together” with entertainment of music and performances. Temple Grandin was the guest speaker for the National Disability Employment Awareness Month event last year and KSC hosted the 17th Annual Disability Mentoring Day for local students. This year Kennedy will be having an informational fair with local vendors: https://daawg.ksc.nasa.gov/. 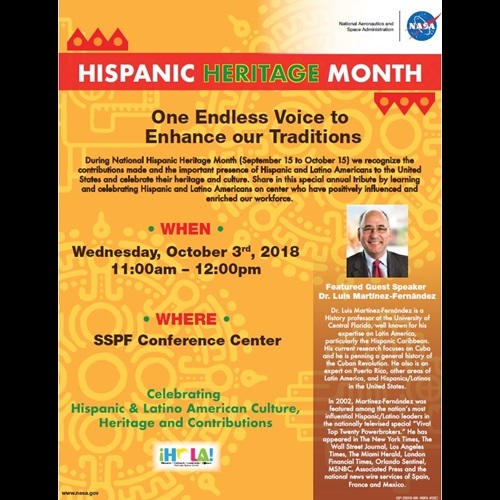 And the Hispanic Outreach & Leadership Alliance (HOLA) will be hosting an event with a guest speaker for Hispanic Heritage Month in October: https://hola.ksc.nasa.gov/. Keep up the great work, Kennedy! 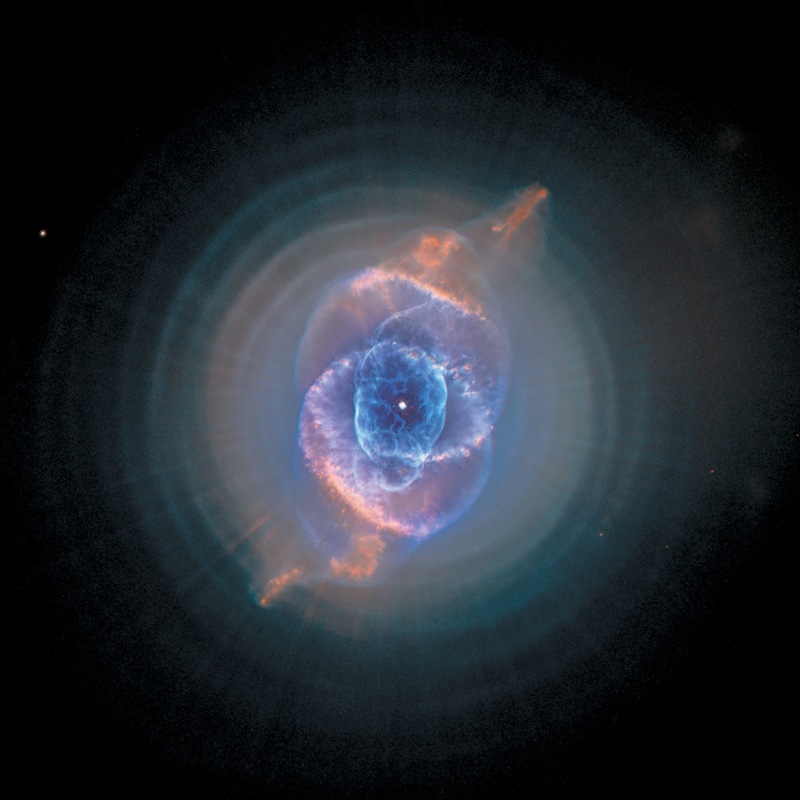 At NASA, we explore the extraordinary every day. The Office of Human Capital Management recently launched a new, dynamic careers site at www.nasa.gov/careers to showcase the people and careers behind our unique mission. The website serves as NASA’s main hub for public-facing talent acquisition information and provides an engaging experience for potential applicants. The site features profiles of our diverse workforce and the world-class talent they bring—allowing readers better insight into our culture and what it’s really like to work at NASA. 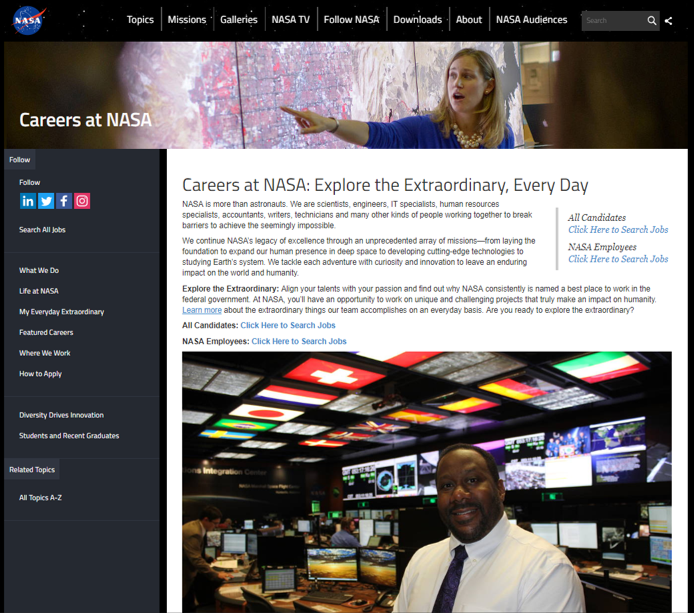 In addition to information on the types of careers available at NASA and guidance on how to apply, the site features a “Diversity Drives Innovation” section with information on minorities in engineering, employee resource groups, and inclusion and outreach. This page features profiles of NASA employees from different fields and backgrounds who share a passion for exploration and a desire to leave an enduring impact on humanity. Check out our careers site today and share it with your network!